This Original Factory Manual Includes Detailed Serivce Repair Information for the Clark TMG12, TMG13, TMG15s, TMG15, TMG17, TMG18, TMG20, TMG20x, TMG25, EPG 15, EPG 18 Forklift Trucks. 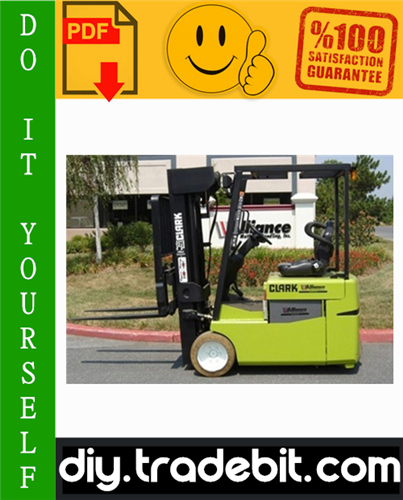 It contains guidance on repair, operation and diagnostics, special instructions for repair and maintenance, instructions for installation and adjustment, assembly and disassembly instructions, step by step instructions, technical specifications, illustrations, detailed schematics and diagrams, troubleshoot and any additional information for Clark Forklift Trucks. Original Factory Clark TMG12, TMG13, TMG15s, TMG15, TMG17, TMG18, TMG20, TMG20x, TMG25, EPG 15, EPG 18 Forklift Trucks Service Repair Manual is a Complete Informational Book. It will give you everything you need to do the job. Save time and money by DO-IT-YOURSELF! SMART, CONVENIENT, FAST! - BUY NOW AND DOWNLOAD IMMEDIATLY! Clark Tmg 12-25, Tmg 13-20x, Epg 15-18 Forklift Service Repair Manual - Download!